Brighton & Hove Albion goalkeeper Christian Walton has joined Plymouth Argyle on loan until January 3. The 20-year-old, who joined Albion from the Pilgrims in 2013, returns to the club where it all began for him - Argyle are five points clear at the top of League Two. Walton, who was part of the England under-21 squad who faced Switzerland at the Amex on Monday, heads to Home Park after an injury to first-choice keeper Luke McCormick. 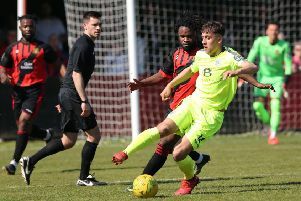 Albion boss Chris Hughton said: “This is a great opportunity for Christian to play first-team football, and I am sure it will be a great experience for him at a club he knows well. “His previous loan was cut short by injury. Now he is fully recovered, has played some matches for our under-21s and has been away with England’s under-21s, so it is a good time for Christian to go back out on loan. Walton played six times for Bury earlier this season, and has also made four appearances for Albion’s first-team, keeping clean sheets in two matches last season. He is in line for his Argyle debut in the Devon derby, when Exeter City visit Home Park this Saturday.